View A is why I bought this pattern. Why? I love the collar band, "V" and the mock wrap style. Cute.., The other two views I've been in other sewing patterns. It's a nice grouping of styles to sew. How well will the collar band fit? Will it gap or lie smoothly against the neck? Will a FBA affect the slight drape across the front of the top? Will the FBA make the front look frumpy? Can I skip the swayback adjustment since it has a waist/hip band? 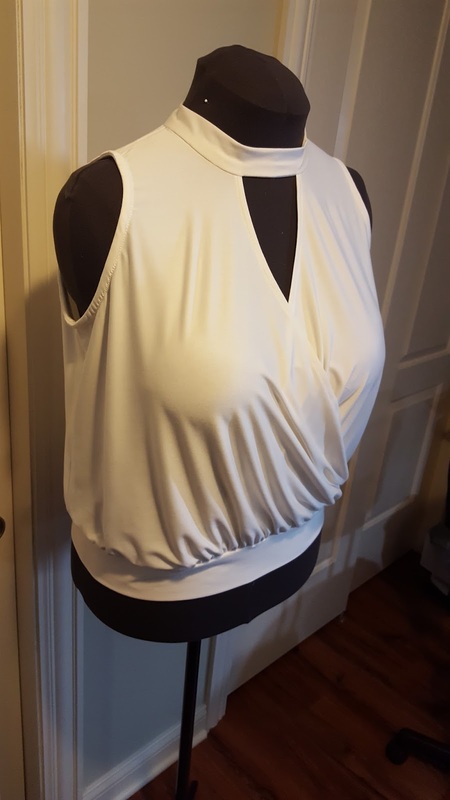 What about the armhole band? Is it visible or is it sewn to the inside of the armhole? 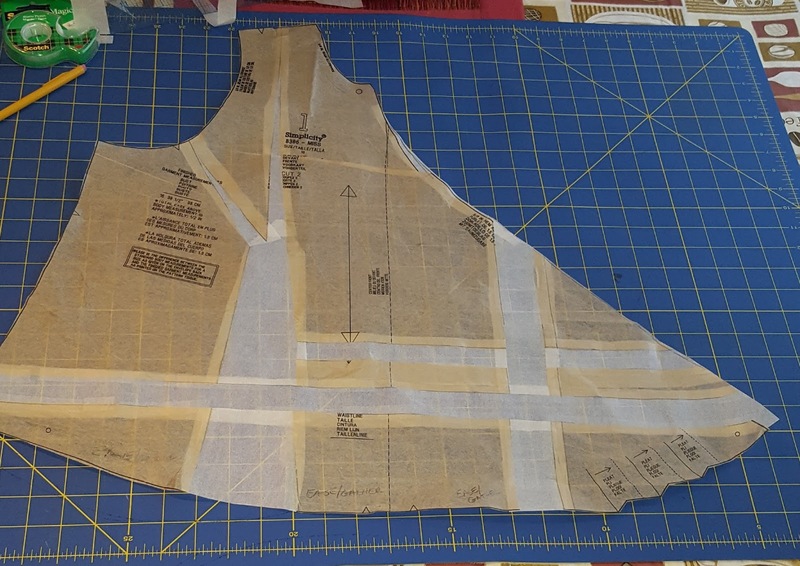 These are the questions I asked myself before and/or during the sewing process. Before I attempt to answer them, let me provide some information about this pattern. 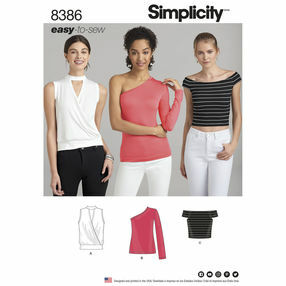 As always, Simplicity's pattern descriptions are vague. But sometimes the pictures, if on a live model along with the line drawing can express a 1000 words. 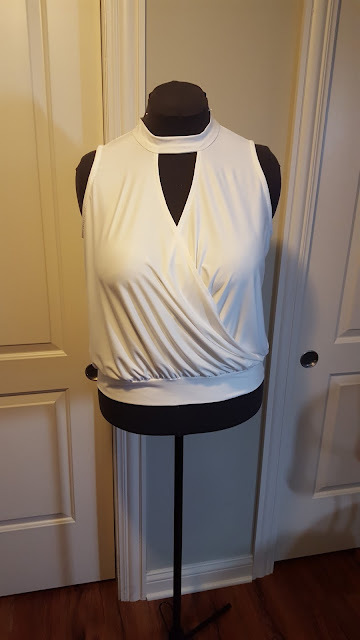 For view A; it is a sleeveless mock wrap knit top with a waist/hip band. 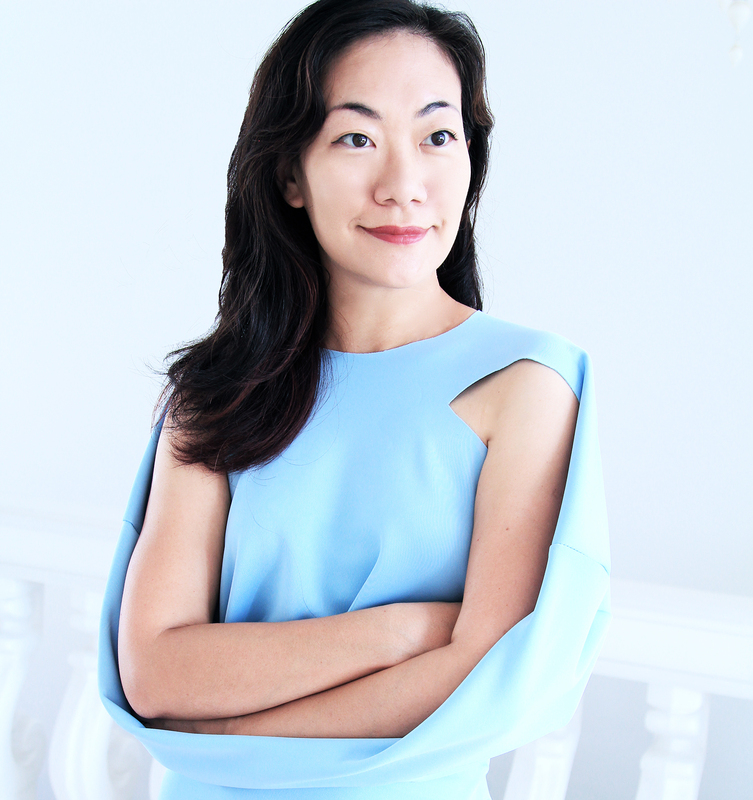 The collar band is attached to the "V" neckline that forms a tie at the back. The armhole are finished with a thin band. This pattern comes in sizes 4 to 20. I used size 16 with modifications. I started the with making a FBA. 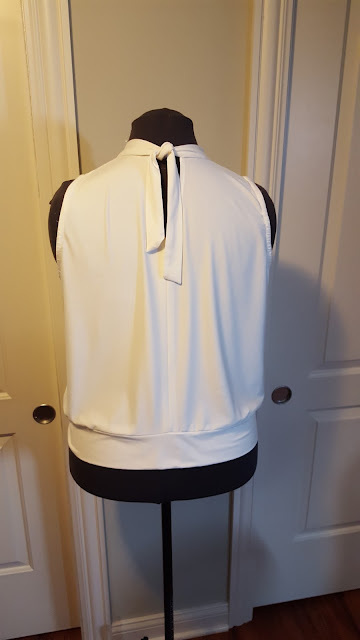 The bottom of the front top has three small pleats. The resulting FBA created more width at the waist. I decided to gather the access to fit the lower band. I also added an extra inch to the length of the top. It is a little hard to see, but right below the word Simplicity and the pattern number, I made a small tuck to reduce gapping at the chest area. Still I hoped that the gathering or easing would not make the top look frumpy. 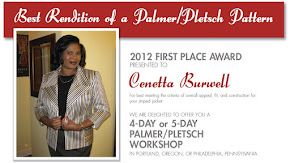 See photo below for the FBA. For the back, I chose not to make a swayback adjustment because of the lower band. 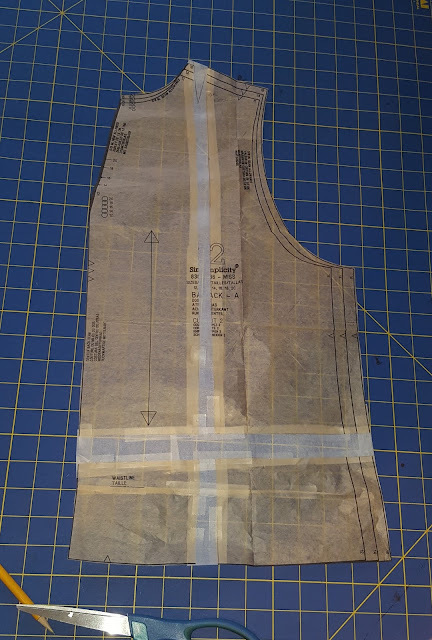 I added 3/4" width for my prominent shoulder blades and I added an inch to the length. The 3/4" was eased in because I did not want to sew a dart. The additional inch makes the side seams front and back the same length. Also notice, the center back has a "V" too. Typically, I read the instructions before I make the garment. But I forgot about how to finish the armhole bands. So instead of attaching them to the armhole, I did an extra step of turning and stitching the bands to the inside of the top. After completing the step, I looked over the instructions again and noticed the difference. It's all right, though. Next time I'll make the top with the band exposed. I had to tweak it just a little bit to get rid of a small gap of the side of my neck. I just made the length between the notches about 1/2" shorter. You may need to adjust the lower band. Measure it and determine whether or not you need more or less width. Also, take into consideration the length of the top and where you want the lower band to rest. The fabric recommended are knits with at least 25% stretch. 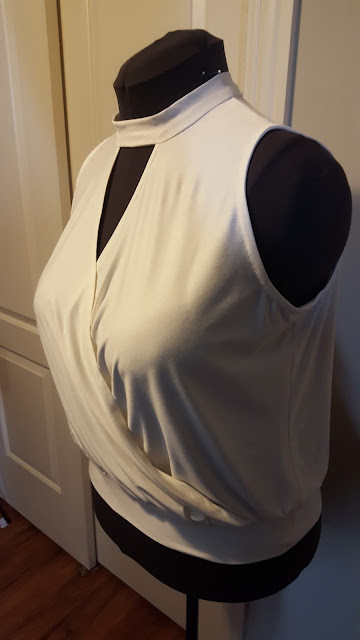 I used a lovely bamboo knit from Mood Fabrics. It's so silky and smooth. Definitely a premium knit that was great to work with. Oops, I've Been Too Quiet Again! 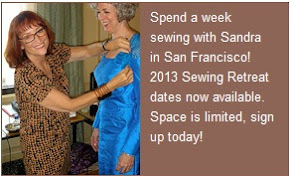 Sorry, I know it seems like I've taken a hiatus from sewing. Really, I haven't. Actually, I've sewn several garments over the past two months; but it's been difficult finding the time to take pictures or the photos shoot ends up not so good. What is becoming more and more difficult to do is to blog on a regular basis. I took a part-time job in a dental office. It's nothing like my former career in IT at the University, where I could key out a post with no problems. There is almost zero time during my off days to actually sit down at my laptop or desktop to type out a blog. More and more I'm viewing Instagram and Facebook instead. Both are quick ways to stay connected. 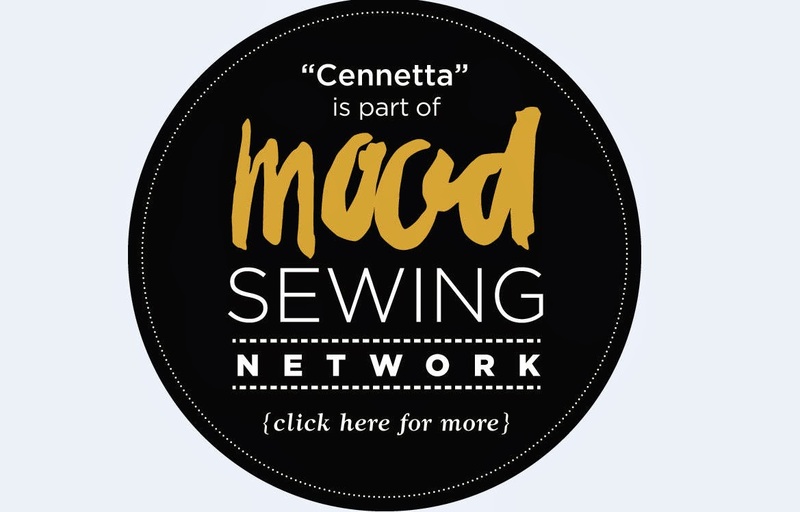 I still feel, though, that blogging is a better way to journal my sewing journal, share my experiences, and learn from others. So, it's an effort that I hope to continue. Currently, I have multiple projects going at the same time. One is the "Shirt Project". Early this summer, I decided to practice making button-down or button-up shirts. My goal is to learn to fit and sew them well. Currently, I've made five shirts. My quest got the attention of the HCC President and the Program Director; they asked if I would do a presentation on my shirts. Of course, I said yes. But it meant that I would need to make more shirts to show different design and style elements. The process also gives me a chance to identify some tips and techniques that may be helpful to others. In the coming weeks, I hope to post a few more shirts. 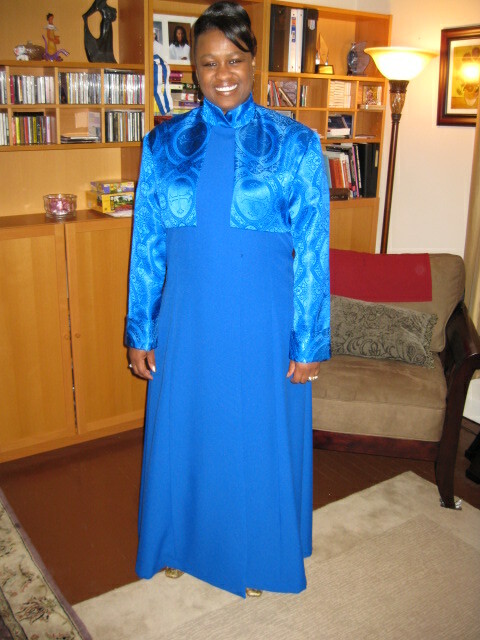 Secondly, I'm working with one client, Pastor Jenetta Ross, who I've made several clergy robes for. This time the commission is for two robes: white and gold (already finished and delivered) and a red and black robe. Both made using Simplicity 5386. The white and gold was basically made the same as the blue one pictured here. Thirdly, there are several things on the sewing table for my DD. Starting with a few dresses, a swimsuit (I know summer is almost over, but there is always vacation. ), a coat and a few shirts. Finally, other things for myself I will make several knit tops that include sleeve designs created by Rhonda Buss. Sleeves are so very big these days. I've selected a few designs that are trendy as well as classic, if that makes sense. 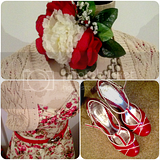 Part of my goal is to continue to try different things to enhance my sewing skills and to jazz up my classic style. Also, I hope to share my thoughts on some fall/winter mini wardrobes. In all of this will emerge my entries for the HCC Fashion Show 2018. That's may sewing "catch up" post. Next up I'll share some "Notes on a Pattern". July is the peak of summer. I love that the days are long and the sun shines so bright. What I hate is the humidity and the extreme temperatures, and everyone has the AC set to "North Pole". So it can be a struggle trying to figure out what to wear. But if you plan to be outdoors, light and airy clothing is the way to go! I purchased this lovely Blue Sky Striped Cotton Chambray a few months with the thought of making a shirt. When I pulled it from the packaging, I quickly changed my mind and decided to make some baggy wide leg pants. 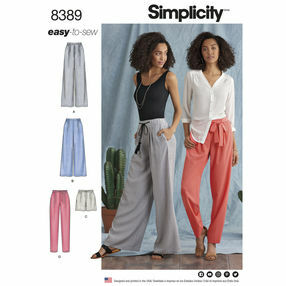 Perfect vacation pants for a stroll on the beach or a day of shopping on some tropical island. Chambray is a classic and is typically used to make shirts, shirt dresses, and tunics. This particular fabrication is lightweight but durable if that makes sense. And because the pants are very roomy, there is little to no stress on the seams. I love the way it feels and moves when I'm wearing them. The pattern (S8389) I used is relatively new. Style like pj pants with a faux drawstring in the front. Nothing fancy at all. These sewed up very quickly. If you can sew a straight seam and make an elastic casing, you can make these. I actually, bought the pattern for second view on the pattern envelope. After cutting out the pants, I had enough leftover to make a little top (S1371) to wear with them. This is the second time I've made it. My first top was also made with Mood African print fabric several months ago. 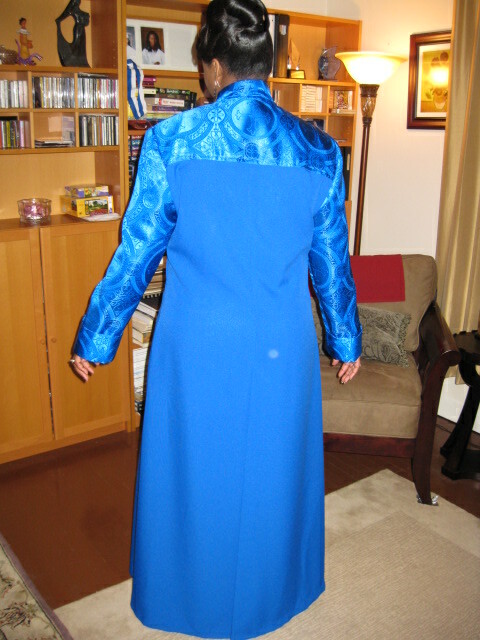 The details on making the adjustments and sewing it are on my blog. That's it! This was a very easy sewing project. My new outfit is perfect for the summer heat and a great look for a stroll along the beach.